February 4, 2016 at 5:30 p.m. Celebrate the opening of “First Folio! The Book That Gave Us Shakespeare,” on tour from the Folger Shakespeare Library, at the Marianna Kistler Beach Museum of Art with an evening of Shakespeare-related activities, refreshments and hors d’oeuvres. View the folio and ask questions of gallery interpreters, learn about Shakespeare and his time during scholarly speed talks, and listen to performances in the galleries. Members of the Friends of the Beach Museum of Art are invited to a preview reception from 5-5:30 p.m.
What is the First Folio? Macbeth, Julius Caesar, Twelfth Night. These famous plays and 15 others by Shakespeare would probably have been lost to us without the First Folio. Published in 1623, the First Folio is the first collected edition of Shakespeare’s plays, and only 233 copies are known today. To mark the 400th anniversary of Shakespeare’s death, the Folger Shakespeare Library is sending a First Folio to every state in the United States; the Beach Museum of Art was selected as the venue for the Folio’s display in Kansas. 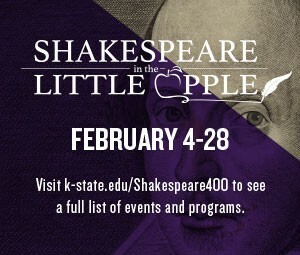 Join us in 2016 as K-State honors the greatest playwright of the English language with this exhibit from the world’s largest Shakespeare collection. “First Folio! The Book That Gave Us Shakespeare,” on tour from the Folger Shakespeare Library, has been made possible in part by a major grant from the National Endowment for the Humanities: Exploring the human endeavor, and by the generous support of Google.org, Vinton and Sigrid Cerf, and other generous donors.